Due to the future release date, an order which includes this title will not ship until April 30, 2019. Handmade soap is made extra-special with the addition of milk! Soaps enriched with milk are creamier than those made with water, and milk's natural oils provide skin-renewing moisture and nourishment. 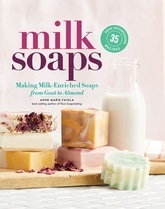 In Milk Soaps, expert Anne-Marie Faiola demystifies the process with step-by-step techniques and 35 recipes for making soaps that are both beautiful and useful. She explains the keys to success in using a wide range of milk types, including cow, goat, almond, coconut, hemp and rice. Photographs show soapmakers of all levels how to achieve a variety of distinctive color and shape effects, including funnels, swirls, layers, and insets. For beginners and experts alike, this focused guide will have you making beautiful, luxurious soaps.